WesSpur's crane sling uses Samson Quantum-X rope to create a crane sling that is truly up to the job. This 3-sling set has 2 x 25' slings and 1 x 30' sling, and is available with or without a Crosby rigging ring. Slings feature big 12” eyes, color-coded stitching so you know which sling is which length at a glance, and shot stitched into the tail of the sling to improve handling. Sling Working Load Limit: 7,056 lb. These slings were designed from designs by Niceguydave with input from Mike Teti, owner of Custom Climber Services. They were first released at the Crane Safety Climber School 2016 and have proven themselves to be the go-to, heavy hitter for big, balanced crane picks. Our crane slings have the correct tag for critical lift operations as required by OSHA. Quantum X was the line that Niceguydave chose after careful consideration of the unique requirements for balanced picks in crane work. Crosby Ring Upgrade: The Quantum X crane sling kit can be upgraded with the addition of a forged Crosby rigging ring. This idea was brought to us by Rob Thigpen out of Bucks County, PA. This makes it easier to deploy on the hook, reduces loading issues on the hook, makes it easier to eyeball sling leg angles, and leaves more room on the hook when more than 3 slings are needed. The perfect setup for the contract climber or tree service that does a lot of crane removals requiring balanced picks. “All that I can say about these slings is WOW! I was down at the 2016 crane workshop in Penn and Nice Guy Dave had us demo them and put them through the works. We used them in rain, sleet and freezing snowy conditions all the while sometimes having to drag them through a quagmire of mud and slush. The slings performed flawlessly. As a matter of fact, the more that we used them, the better the fibers worked themselves into the slings, thus reducing potential picking. As a matter of fact, I don't recall any picking issues, such that you can sometimes get with regular Amsteel slings, or even Tenex. One thing that we do want to point out to riggers who choose to use these slings, is to tie them with a Cows Hitch, backed up with 2 slipped half hitches for easier removal, once the piece has been let down and you are ready to untie them from the crane. We did run into some minor issues when climbers used Clove Hitches backed up with regular tight half hitches. It just made it harder to have the ground crew untie them. We've built upon the success of the WesSpur/The Crane Man sling above to bring you this fully-functional set of crane slings at a more affordable price point. If you own a crane or frequently do crane jobs, the Quantum X sling above is built to be the best Crane Sling for tree removals. If you don't do enough crane work to justify the Quantum X sling, the Amsteel II sling is for you. Built with the same convenient features - large eyes, color-coded ends, and chafe sleeve, this set of crane slings made from 9/16” Amsteel II Plus, and provides a 5:1 WLL of 4,441 lbs in the vertical choke with a cow hitch on the load. This 3-sling set has 2 x 25' slings and 1 x 30' sling. Samson Amsteel II Plus is a class II double braid with super-strong high modulus core protected with a tightly-braided, firm cover that is coated for additional abrasion resistance and visibility. If you are looking for the right combination of performance, strength, and affordability, this is the crane sling for you. Crosby Ring Upgrade: The Amsteel II Plus crane sling kit can be upgraded with the addition of a forged Crosby rigging ring. This idea was brought to us by Rob Thigpen out of Bucks County, PA. This makes it easier to deploy on the hook, reduces loading issues on the hook, makes it easier to eyeball sling leg angles, and leaves more room on the hook when more than 3 slings are needed. The perfect setup for the contract climber or tree service that does a lot of crane removals requiring balanced picks. These round slings with Crosby Shackles make a sling kit perfect for vertical trunk picks. These slings can also be used to extend one of your balancer slings for added length. Each kit contains 2 round slings of the specified length, and 2 US-made Crosby Shackles. KIT93: 15' Heavy Duty Loop Slings (WLL: Single Leg 13,200 lb; Choker 10,560 lbs; Basket 26,400 lb). KIT94: 20' Heavy Duty Loop Slings (WLL: Single Leg 16,800 lb; Choker 13,440 lb; Basket 33,600 lb). Bring down multiple branches at once in the pockets of the Long Jake Crane Sling. 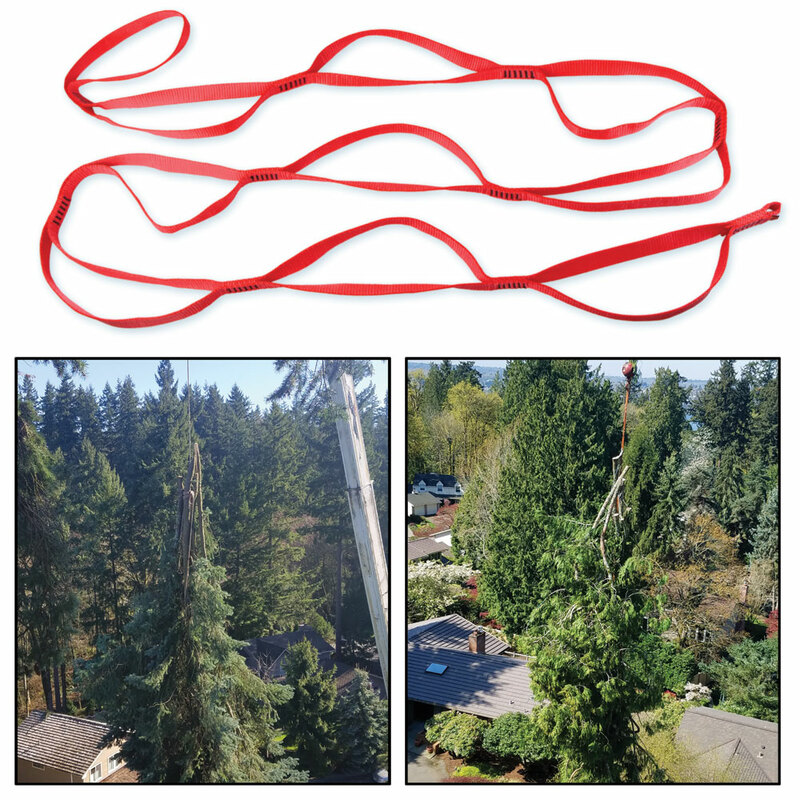 The Long Jake Crane Sling is ideal for tight landing zones where there is not enough room for a conifer trunk with the spread of branches still attached. Remove the branches and load up the Jake Crane Sling for a single pick. 50 kN rating. The Long Jake Crane Sling was conceived by crane team supervisor Jacob Rogers at Eastside Treeworks. Jake presented the concept to Dave Stice and Mike Teti at the Crane Safety Climber School 2018 as a Tenex sling. For the WesSpur version, Dave changed the material to 1" flat nylon webbing, making it lighter, less expensive, and easier to use in the field. This sling has been extensively field-tested with excellent results. This is the same rig used by The Crane Man, INC on all of their cranes. The 1" Flat webbing strap is rated to 14,000 lb. The two 3/4" Crosby shackles orient the anchor perfectly to keep the moving rope system fair off the ball. The strap is covered in Spiral hose protector, giving excellent abrasion resistance as well as making it easy to inspect the strap. The 1" Crosby shackle at the bottom easily allows those who choose to leave their carabiner on the rope to pass through the anchor. CM galvanized steel shackle. 3/4” / 20mm bar stock. 13,000 lb WLL. CE certified. Made in the USA. US-made Crosby shakcles with pin. Combines technical info from professional crane operators and arborist who use cranes to cover fundamentals and go beyond the basics. Includes free green log weight chart. Spiral-bound, 50 pages. The Rigger's Bible is a general reference guide for riggers and crane operators. Although it was written with the construction industry in mind, the concepts and data it discusses are still pertinent to the tree service industry because of the similarity between the applications. Both tree and construction riggers commonly employ the use of cranes, mechanical advantage, and similar working loads in their rigging systems. Because the principles of physics it discusses are universal, this book is an excellent resource for anybody who does heavy rigging. 144 pages, hardcover, b&w illustrations.